One of the most formidable players in the history of soccer, Franz Beckenbauer is decidedly a living football legend. Born on September 11th, 1945 in Munich, Germany, the strongly influential figure in the fascinating yet challenging world of soccer is a two-time winner of the prestigious European Footballer of the Year (Ballon d'Or) award, in 1972 and 1976, respectively as well as the only person in soccer history to have both captained and managed World Cup winning teams, in 1974 and 1990, respectively. 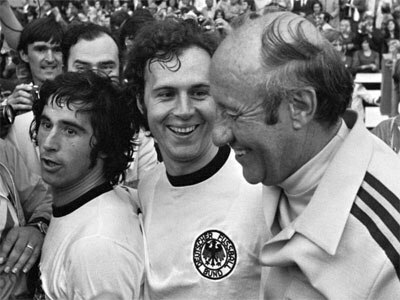 Beckenbauer in the middle, flanked by Gerd Müller and Helmut Schön. Deeply passionate about football since he was a kid, Franz Beckenbauer joined the youth team at Bayern club in his hometown at the early age of 14 and in 1961 he resigned from his trainee insurance salesman position to achieve his dream of becoming a renowned professional football player. In 1963, the Bundesliga, the top-tier of the German football league system was established, but Bayern Munich was not selected that year for the Bundesliga. Franz Beckenbauer nevertheless made his team debut with Bayern Munich a year later, serving first as an outside-left and soon after as a midfielder. In its first season in Regional League South, Bayern Munich got promoted to Bundesliga and it went on to achieve both local and European success in 1966 and 1967. Beckenbauer got promoted to captain of Bayern and fervently led his team win four national titles as well as three consecutive European Champions Clubs’ Cups (1973-1976), reaching a pinnacle in his outstanding career as the player who dominated German football in the 1970s. Within a year of his first debut, he also started out his international football career playing for West Germany; throughout his remarkable career, Beckenbauer scored a whopping 14 goals for the West Germany team and won a total of 103 caps. In the memorable match that qualified West Germany for the 1966 World Cup, he proved his coolness of character, one of his trademarks that would come to be widely celebrated. World-famous for his smooth, distinctively elegant style and deftly-planned, intelligent tactic, Beckenbauer earned the admiration and respect of his fellow football players, coaches and managers. An incredibly versatile, intelligent and graceful footballer that played in three World Cup finals, Beckenhauer received the honor of being touted "der Kaiser" or "Emperor Franz". He also achieved international fame by inventing the modern position of the attacking sweeper (also known as "libero"), a key player whose role is to initiate the offense from central defense using powerful long runs and deft passes. 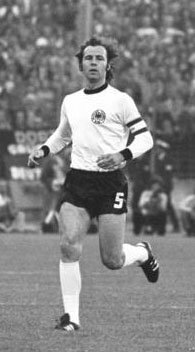 In 1971, he was appointed captain of the West Germany team and led it to victories in the 1972 European Championship as well as the 1974 World Cup. In late 1970s, Beckenbauer did as Pelé and started playing for the New York Cosmos and the team was extremely successful in the North American Soccer League these years. After a return to German football in the Hamburg team (1980-1982), Beckenbauer putting a glorious end to his player career in 1984. In 1984, Franz Beckenbauer was appointed manager of the West German team, which became the 1990 World Cup winner and thereafter he managed both Olympique de Marseille (1990-1991) and Bayern Munich (1993-1994 and 1996, respectively). Beckenbauer has enlarged to an institution in German football, but his legacy has also been hit by claim of corruption.